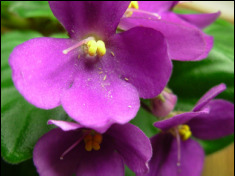 Thrips - African Violet Society of WA Inc.
What are thrips and why are we worried about them? Most gardeners know thrips as a pest in gladioli and other flowers. Only occasionally have we been troubled by these thrips on indoor plants, and if they did venture in, they were mostly eradicated with the simple spray of a pesticide of low toxicity. But what we are dealing with now may be a different thrip - the feared Western Flower Thrips (WFT), more formally known as Frankliniella occidentalis. Western Flower Thrips is endemic in North America and has been established in New Zealand for 60 years. It is also found in other countries including Japan, parts of Africa and central America, and more recently Europe. It has been seen in Australia for several years. Many of our members have experienced a thrips infestation of their plants which led me to believe that the thrips troubling us is Western Flower Thrips. None of us have, so far as I know, had these thrips formally identified. Personally, I have been more interested in their eradication than in preserving some for identification by an entomologist. According to experts, they are impossible to distinguish from other thrips species with the naked eye. Any small (1mm long) pale yellow or buff colored thrips could be Western Flower Thrips and only with the use of a microscope (>50x mag) can the distinguishing long black spines on the front edge of the shoulders be observed. The small size of the insects and their thin narrow shape also makes it very difficult to even tell their color, because what one grower sees as brown is likely what another calls buff. I feel that identification is not the most important issue. Other thrips which may infest your violets will do similar damage, and they may be eradicated in similar fashion. The big difference is that WFT is resistant to many pesticides and thus much more difficult to deal with. So what do thrips look like, and what damage do they cause on African violets? As already said they are narrow in shape up to 1mm long and pale yellow to buff in color. The accompanying drawing gives some idea of their appearance. They are not easy to see on your plants because they have a retiring habit and will usually shelter in the more hidden parts of the plant and the flower. You will soon know that they are present, however, because you will see the damage which they cause, particularly when they feed on the pollen of the flowers. Flowers never reaching their expected size. Some leaf damage has also been attributed to thrips, but as none of our members have seen the thrips actually eating the leaves, it is hard to know whether this was the result of thrips or of one of the multitude of other possibilities. If your plants have some of the above symptoms, then you may have an infestation of thrips, especially if you find that there is hardly a fresh, healthy flower to be found. However, do realize that each and every one of these symptoms can have other causes. Flowers can become dried out and buds refuse to open because of very low humidity. Pollen sacs can also be nibbled by cockroaches, mice, and other pests. So you will have to examine the flowers carefully to be sure. Use a good light and a strong magnifying glass to look at the flowers carefully. Sometimes, flicking the stamens with your fingers will send thrips running, and you will be able to see them. You may have to pull some flowers apart because the thrips may well be hiding right in the base. They may also be clustered on the back of the flower. If you are still not convinced, break open some buds. If there is damage to the pollen sacs even before the flowers have opened, it is virtually a certainty that you have a thrips infestation. How do African violets become infested? Probably the first thing you will ask is, "How could my plants get thrips?" The answer is, "All too easily". 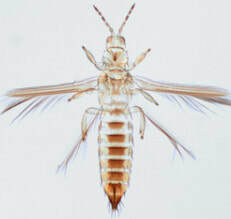 As you see from the illustration, thrips have wings. They can fly. They can also be wafted long distances on air currents, so what is to stop them from wafting right into your African violet growing area? Probably nothing! As with other pests, you may bring them indoors on your hands or your clothing. They can hitch a ride on cut flowers, the family pet, or on plants that have been taken to a meeting. Placing tablets of camphor, naphthalene, or bathroom deodorizer among theplants. I have not gathered all this information in order to frighten you from ever growing African violets. That would certainly not be my aim. And yet, in a sense, I am trying to frighten you - just enough to alert you to the danger. Once aware of it, we will be able to deal with it much better. But remember, it will be an ongoing fight. We will need to watch for the earliest signs of thrips on our plants. If they are dealt with early, it is probable that they will be easier to get rid of than if we wait until they become established.